Cassini Maps - Cassini Maps - Genealogy and maps. the perfect match. Many people today are interested in genealogy to understand not just where and when people lived, but also their lifestyles, surroundings and motivations. This often requires knowledge of old political boundaries, migration trends and historical social conditions. One important way to understand how one's ancestors fit into the landscapes of the past is to place them in space and time by using historical mapping. Genealogical research is a complex process that uses historical records to answer questions about one's ancestors, the time they lived in, the work they undertook and their surroundings. Reliable conclusions are based on quality sources and historical maps have an important part to play in discovering where and how your ancestors lived. 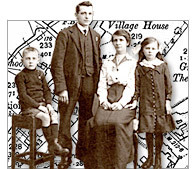 From the beginnings of Britain's industrial past to the more sedate life of a Victorian country village detailed mapping can help to put the lives of your ancestors into context. The interest in old maps is constantly growing as more maps become available and the ability to see more detail allows the researcher to view ever increasing details of the past. 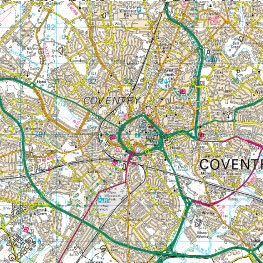 For example - In the last 200 years Coventry has grown in population from 21,853 in 1801 to 310,500 in 2010. 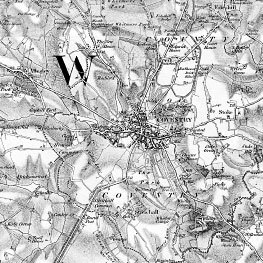 Many of the old outlying towns and villages have been absorbed into the conurbation we see today and the only way of understanding the landscape they used to live in is to view the maps of the time. From the beginnings of Britain's industrial past to the more sedate life of a Victorian country village detailed maps are now available to put the lives of your ancestors into context.